Orchestras in the US have been offered a hi-tech solution to the problem of ageing and ever-decreasing audiences. At three performances by the New York Philharmonic Orchestra last month there were scores of people listening to the music while clutching hand-held computers. But they were not rudely checking e-mail, or surfing the net, but rather taking part in a trial of a new technology which may help re-invigorate people's interest in live classical music. The device's creator Roland Valliere said he was inspired to create the device after working as an director to orchestras across the US for more than 20 years. "Music seems less and less accessible to people - there are more demands on people's time. "Music is a language but it is one fewer people are familiar with. The idea was to give people information about the music while they are at the concert." "Audio guides are an aural enhancement of a visual experience while the Concert Companion is a visual enhancement of an aural experience." The device itself is a top of the range HP iPaq - a hand-held PC with a colour screen that communicates via wireless connection to a base computer. 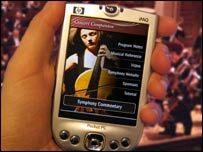 An operator who follows the music score then feeds live text information to the hand-held computers as the music is played. It is only recently that advances in hand-held development have created the technology that can produce live, video and text commentary delivered by wireless connection. "So much of this is serendipitous," said Mr Valliere. Live video footage of the conductor and lead soloists is also broadcast to the devices. "Now you can see the conductor's expressions and gestures for the first time," said Mr Valliere. The device was developed under the auspices of the Kansas City Symphony and has been audience-tested by the Pittsburgh Symphony and New York Philharmonic orchestras. Music critic Greg Sandow, who writes the text for the devices, said the commentary was "the hardest thing I have ever written". "You have very little time to say as much as possible about something that is very far from being verbal." Mr Sandow said he hoped the device could attract new audiences to classical concerts. "There is a sense in the classical music world that the audience is falling off and that it is time to make it more appealing to a new audience or those who do not go to concerts very often. "The audience is old and getting older. It is not clear that a younger audience will be there to take its place." Mr Valliere said orchestras could lease the devices and audiences could either pay to use the companion or have it included in the price of their ticket. He said he was hoping to bring the device to the UK at the annual meeting of the Association of British Orchestras in February next year.